Quick little painting projects I can complete in just a few hours are incredibly satisfying! Accent tables like this mid century demilune are a perfect candidate for injecting bold color into your home. I've been experimenting with Annie Sloan's Barcelona Orange on all my recent projects, and it's a surprisingly versatile color. 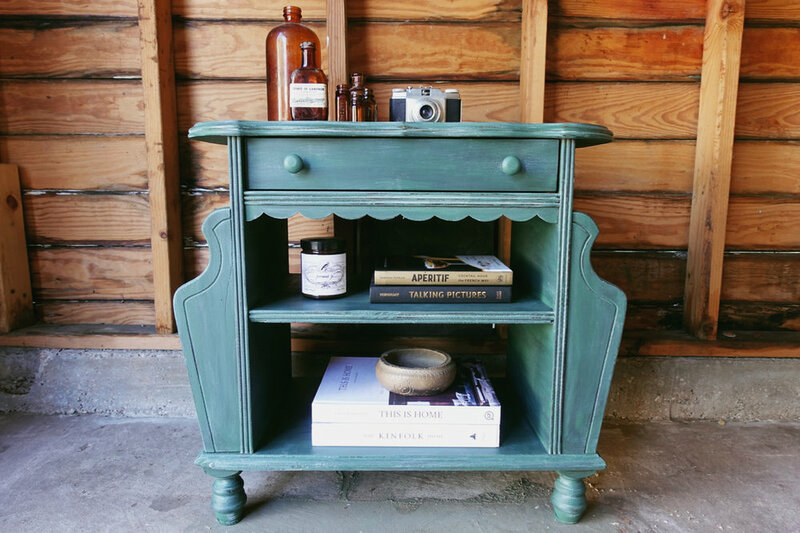 With mid century pieces, I almost always will keep things simple, work with a solid color, paint on two or three coats, lightly sand to get a smoother finish and seal it with clear wax. I prefer this route since the colors remain vibrant. Keeping the paint process simple and unfettered with allows the classic features of mid century furniture to really shine. I love the tapered, boomerang style legs, the demilune top and coordinating shelf. The retro details coupled with this deep orange are a really satisfying combination for me. 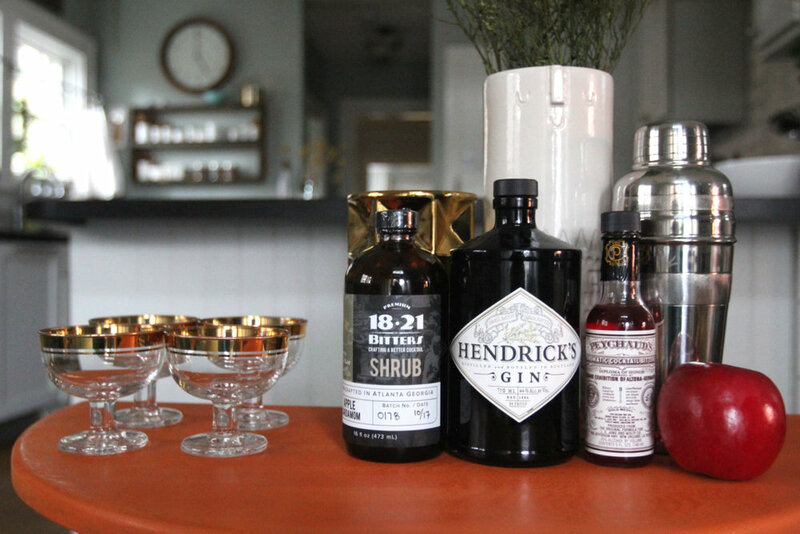 For my photos, I styled the piece as a bar table, cobbling together a few ingredients for a lovely little fall cocktail [more on that coming to my other website, States of Reverie!]. 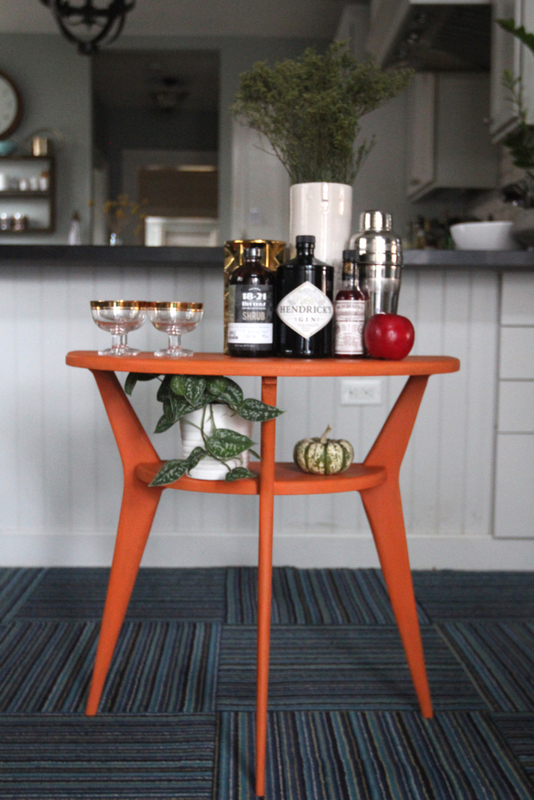 Currently this little table is hanging out behind one of my sofas, but I could see this working as a nightstand too! Painted accent tables like these are perfect for adding a bit of color in almost any space. I'll have it posted for sale in my shop soon! That being said, I once had this little red trunk that I adored. As beautiful and bright as this trunk was, the interior of it was a little funky, which made storing anything inside it a bad idea. So when a client saw it and asked if she could buy it and for quite a bit more than I'd paid, I said yes without giving it much thought. Silly Jo. I still think about that trunk, and it is one of the things I regret parting with. Now for some trunk redemption...Recently my mom was at a local thrift shop and saw they were selling a variety of trunks, three to be exact. She sent photos, and I replied with, 'BUY THEM ALL.' She assumed I was kidding, but oh no, I don't kid about my trunks. I couldn't say no! Each one is so different from the next, and stacked together they look fantastic! I did have an immediate favorite of the three, and have already decided it will not go for sale, because it's the buried treasure trunk of my dreams! It's small and wooden with leather handles and it photographs beautifully! I've decided it's a perfect storage piece for styling fabrics, and it also works well as a styling piece to place in furniture photo shoots [I already used it when photographing this darling lavender chair!]. The other two I will likely put up for sale in the future [time will tell], but for now they're all making for a lovely vintage/industrial addition to my home. On rainy days I like to tidy. It clears the mind and helps motivate me to tackle new projects. Yesterday was particularly soggy, so I managed to tackle a few rooms in my house. Due to an overly zealous beagle mix named Watson, the baby of our family, we had to rejig the the house a bit to help 'puppy-proof' things a bit more. We used to have the small leather sofa in front of the window looking out onto the sidewalk. Watson has constant anxiety when seeing other dogs, humans, moving objects on the street, and would ransack the sofa, tossing off all the pillows, nose pressed up against the window pane, barking, howling, whinging at every passerby. I decided to move the sofa away from the window, giving it a new home in the adjacent room, creating a new and cozy sitting area. Now a dresser I currently have up for sale sits in front of the window, helping block the view of possible 'intruders' and prevents Watson from jumping on any of the furniture. It seems like a minor thing, but I'm already noticing a quiet calm wash over the house. So much less yelping! In the room where I paint and photograph all my furniture, I put together a new wall gallery, prepped for the next piece I'll photograph on this wall. When I'm not working in here, we use this space as a workout room and spot to watch TV [there's an elliptical along the window and when there's not a giant dresser taking over, I have lots of space to do yoga, lift weights do a HIIT video or dance around to music [probably my most favorite workout choice!]. I also use this room to organize most of my styling props. I just finished this tall bookcase, and it's perfect for housing my treasure trove of objects. Having all my little things placed on the shelves in an aesthetically pleasing manner is oddly important to me. I spent a good hour alone just rearranging everything on the shelves, trying to squeeze as much as I could, while still having it all organized and pulled together. I have to say, even though yesterday wasn't spent working on furniture or writing, I felt really accomplished and at peace by the time 5 o'clock rolled in. Putting physical things in place manages to put my mind in place. Putting physical things in place manages to put my mind in place.